This week I did not do much planning as to what I was going to upload. 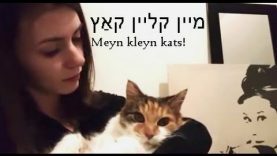 So, here is another language video as I have only done 1 video before in Yiddish. Many of you have been asking where and why I learned this language. And no, I’m not Jewish! Maybe a little Jew(Ish), though. There are time stamps below as the video is lengthier than expected. I hope this provides you with some tingles from the cue cards, or relaxes you, and makes you laugh a bit.